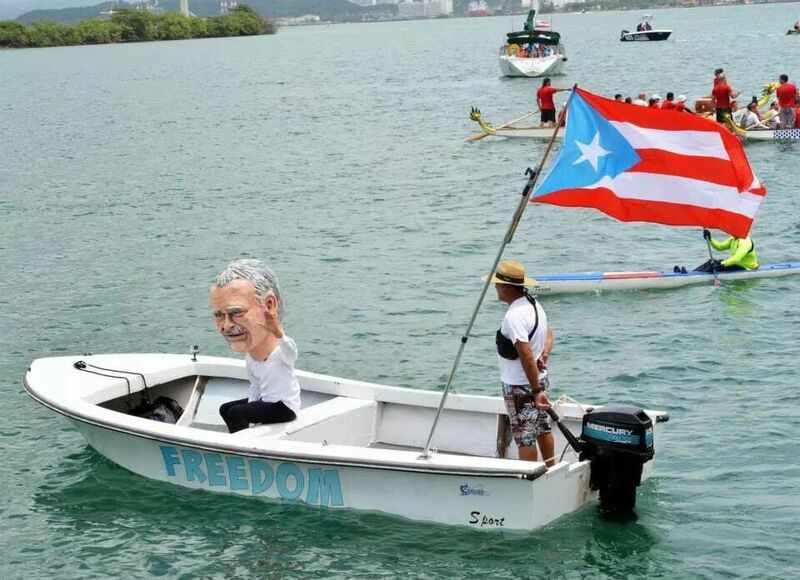 town of Gurabo and toured 33 towns in 33 days to raise awareness about the case of López Rivera and to gather support for the call for his release. Each day one town was connected with another in a 333 mile walk through winding mountainous roads. 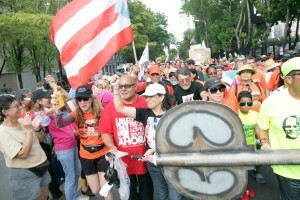 While a small, hearty core group of activists and supporters participated in consecutive daily walks, each town added its own flavor, sometimes its own mayor, and often hundreds of walkers — an eclectic group of young people, seniors, athletes, elementary, high school and college students, unions, musicians, civic and religious groups, elected officials, those in wheel chairs and the able bodied, pro-independence activists, supporters of the present political status with the U.S., as well as supporters of statehood. People in small rural villages and barrios stood and waited at their front gates for the “Caminata”. Passing cars blasted their horns and shouted their support. Children came out of their classrooms to shout approval and display signs they made themselves, of love and support for Oscar. Some schools even allowed their students to leave the classroom to join the walk. 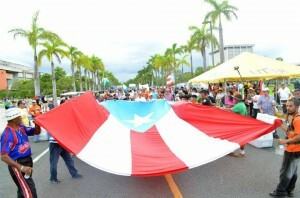 When the walk reached each town’s plaza, a beautiful cultural event took place with music and poetry. Under a blazing afternoon sun, children sang while others read their writings dedicated to Oscar. 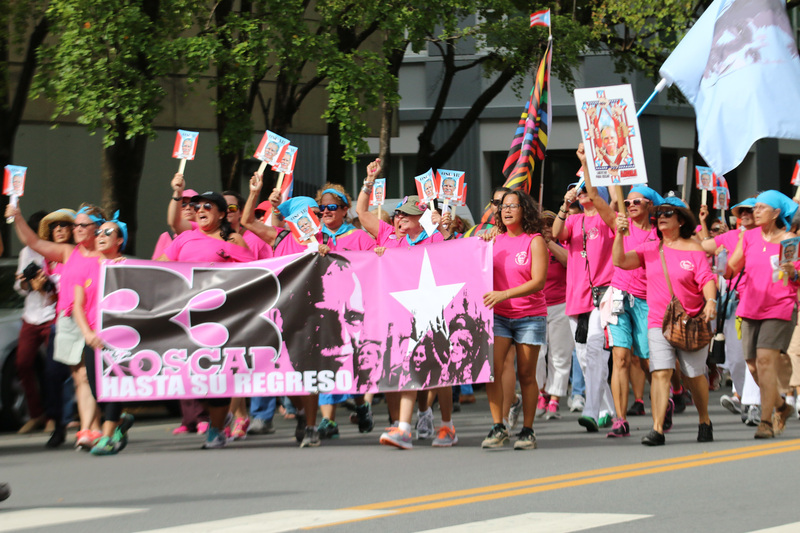 As the walk in the mountains was underway, another event took place in San Juan called “Al Mar X Oscar” (To the sea for Oscar), inspired by a letter from prison to his granddaughter Karina, in which he wrote, “… after the family, what I miss the most is the sea. It’s been 35 years since the last time I saw it.” On a beautiful Sunday afternoon on May 25, hundreds marched along the waterfront of Old San Juan while row boats, paddle boats, rafts, kayaks, fishing boats, long Asian inspired dragon boats, jet skis, practically anything that could float accompanied them. 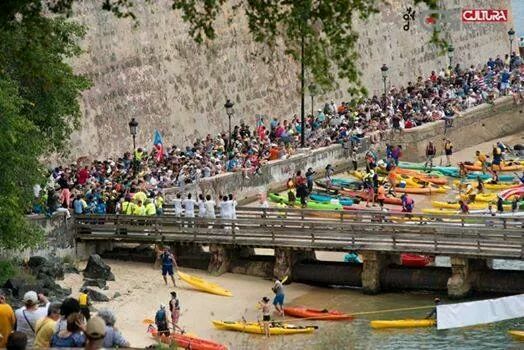 At the foot of the century old walls of the Spanish fort, El Morro, the water crafts landed with a “cabezudo” papier-mache puppet head representing Oscar wading on shore symbolically representing his arrival to Puerto Rico by sea. Oscar’s daughter Clarisa López and granddaughter Karina Valentín emotionally greeted the symbolic Oscar. At a cultural and political rally held in front of El Morro, Clarisa stated, “We are going to achieve what seems the impossible … returning my father to the motherland …” The multitude present shouted their approval. 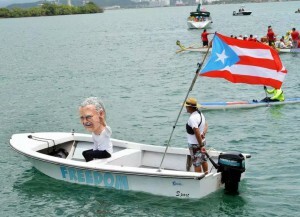 At 71 years of age and having served 33 years in remote prisons, far away from his country, accused of seditious conspiracy, but never having been found guilty of shedding any blood, Oscar López Rivera is the symbol of a flagrant dishonor for his jailers and an affront to democracy that fails to respect human rights. 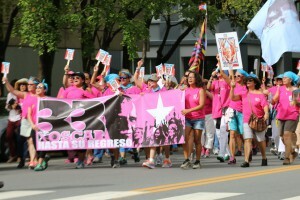 In spite of the unanimous demands of the people and from every sector, and important voices in the international community, Oscar López is still held in a prison in Terre Haute, Indiana. The United States government persists in ignoring the call for his release. The government of the United States is morally impeded from intervening on behalf of any political prisoner, in any place in the world, while the president continues to mock the memory of Mandela, violate civil and political rights and Oscar’s right to freedom. This entry was posted in featured-news, news and tagged Alberto Rodríguez, Free Oscar Lopez, Jan Susler, Oscar López Rivera by Kris Clutter. Bookmark the permalink.